Saborjhian (which translates to "thread painter," the lowliest job in Iran’s traditional carpet-weaving industry), to the more religious Ahmadinejad ("race of Muhammad" or "virtuous race"). Mahmoud Ahmadinejad grew up in an Iran dominated by Western influence. Three years before he was born, the U.S. CIA aided in a coup to install the pro-Western Shah Mohammed Reza Pahlavi as head of state. Many Iranians, led by the country’s Islamic clerics, resented the Western incursion into Iran’s politics. Ahmadinejad held no interest in politics as a young boy. He went to primary and high school in Tehran, and excelled in his studies. He received high marks on the national university entrance exams, finishing 130th out of 400,000 students. He entered the Iran University of Science and Technology in 1975 and received his undergraduate degree in civil engineering in 1979. It wasn’t until he attended Iran University that Ahmadinejad became politically active. Though the Shah’s regime repressed all political activism and descent, Ahmadinejad secretly produced and distributed an anti-Shah propaganda magazine called Jiq va Dad (Scream and Shout). He joined the Islamic Association of Students in the Science and Technology University, a faction of the Office for Strengthening Unity between Universities and Theological Seminaries. The latter organization allegedly planned the taking of hostages from the U.S. Embassy during the 1979 revolution against the Shah. It is unclear whether Mahmoud Ahmadinejad participated in the takeover of the embassy. Some of the former hostages have identified him as one of the student leaders involved in holding 52 embassy employees for 444 days between 1979 and 1981. Ahmadinejad denies this, as do several of his political opponents who were involved in the embassy take over. When Saddam Hussein ordered Iraqi military to invade Iran in 1980, Mahmoud Ahmadinejad volunteered to fight against the Iraqis in western Iran, the home of the Kurdish ethnic minority. Reports are mixed as to whether he became a member of the Revolutionary Guard in 1986. Some say he was, others say he wasn’t, but it is believed he was a volunteer for a paramilitary volunteer militia called the Basij that operated in cooperation with the Iranian Revolutionary Guard. It is also believed that he participated in covert operations near the city of Kirkuk, and worked to not only the stop the Iraqi incursion, but to also suppress any political efforts by the Kurds to form their own state. There remain many unanswered questions about Ahmadinejad’s participation in covert assassinations in the Middle East and Europe. He is suspected of planning the killing of Iranian Kurdish leader Abdorrahman Qassemlou in Vienna in July 1989. While American intellegence agents found no evidence to support this allegation, the Austrian government continued investigating the charge well into 2006. It was also reported that Ahmadinejad planned the killing of Salman Rushdie, the controversial Anglo-Indian novelist who outraged Muslim leader Ayatollah Ruhollah Khomeini with his 1989 book The Satanic Verses. However, evidence is not conclusive on this theory either. In 1986, Ahmadinejad began his master’s program in engineering at Iran University of Science and Technology and in 1989 he joined the faculty. He married another university professor, and the couple had two sons and a daughter together. Ahmadinejad also held a number of government posts during this time. He was appointed governor of Maku and Khoy, cities in the West Azerbaijan province. In 1993, he served as an advisor for the ministry of culture and higher education. In 1993, he was also appointed governor general of the newly established northwest province of Ardebil and served there for four years. He was removed in 1997 by the newly elected moderate president Mohammad Khatami in an effort to move the Iranian government away from its more conservative elements. Ahmadinejad received his doctorate in transportation engineering in 1997 and returned to his teaching position at the university. In 2003, Ahmadinejad was appointed mayor of Tehran by the city council. He was little known outside of Iran at this time, but his charisma and political skills became quickly evident. As mayor, Ahmadinejad began repealing reforms put in effect by the moderates, and imposed new cultural restrictions favored by the mullahs—Iran’s religious leadership—including the closing of Western fast-food restaurants and the covering of billboards with Western references. He advocated gender-segregated elevators in municipal buildings and turned many of the cultural centers into prayer halls during the Islamic holy month of Ramadan. He also ordered all male city employees to have beards and wear long sleeves. In 2005, Mahmoud Ahmadinejad ran for the Iranian presidency with the full support of conservative leaders. Populist in his approach, Ahmadinejad promised to address the poverty and social injustices in Iran, and to work to end corruption. He campaigned on the slogan, "We can do it," and was the only presidential candidate to speak out against improving relations with the United States. On June 24, 2005, Ahmadinejad faced off with his campaign rival, Hashemi Rafsanjani, Iran’s former president from 1989 to 1997. During this second election, Ahmadinejad played the role of a simple man who was one of the people, and portrayed Rafsanjani as a political hack who amassed a great fortune through corruption. Ahmadinejad won the election by a landslide, collecting 17 million of the 27 million votes cast. Whether a masterful politico or an honest broker, Mahmoud Ahmadinejad developed a strong bond with Tehran’s deeply religious working class. Ahmadinejad wanted to continue to live in his own house after being elected president, until security advisers forced him to move. He took out the expensive furniture and rugs in the presidential palace and replaced them with less expensive furnishings. He refused the VIP seat on the presidential plane and eventually replaced it with a cargo plane. He also spoke in blue-collar colloquialisms in his speeches and presentations. While Tehran’s political elite ridiculed him for his mannerisms, the behavior played well with many Iranians, who saw their president as "one of them." 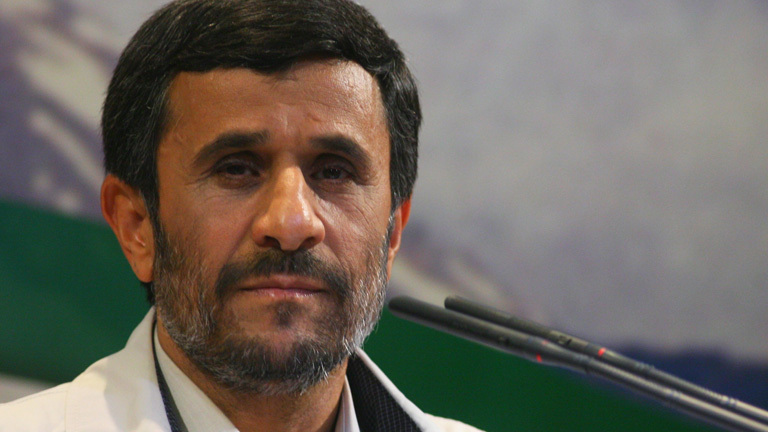 After his presidential win, Ahmadinejad became an imposing international figure. His hard-line stance on Iran’s right to develop nuclear power heightened tensions with the U.S. In a September 2005 speech before the United Nations, Ahmadinejad professed his desire to pursue Iran’s nuclear technology program, which he claimed was for peaceful purposes. At the same time, he condemned the United States for not only proliferating weapons of mass destruction, but also sowing a "climate of intimidation and injustice." He issued a veiled threat that "if some try to impose their will on the Iranian people…we will reconsider our entire approach to the nuclear issue."